She thought she could keep it a secret. Just fourteen years old, Amalie thought she could take off and go to the festival with her best friend without anyone knowing it - without her parents finding out. She thought she was safe when she met a man offering her drugs, she thought she was safe when she went alone to her tent to take the pills. But when she opened her eyes and found herself in the man's basement, she knew she wasn't safe anymore. She was trapped. 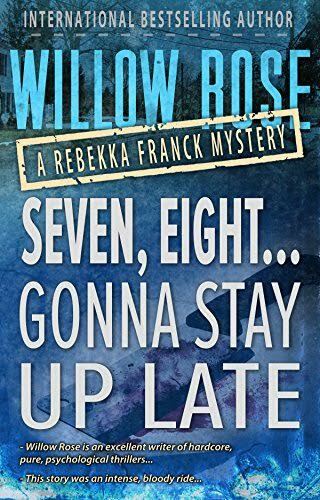 Seven, eight ... Gonna stay up late is a Scandinavian mystery-novel from the International Bestselling author Willow Rose. It is the fourth book in her series about the Danish reporter Rebekka Franck. It is followed by Nine, ten ... Never sleep again.